It must be nearing summer when the Molalla Farmers Market opens. It will run through September. 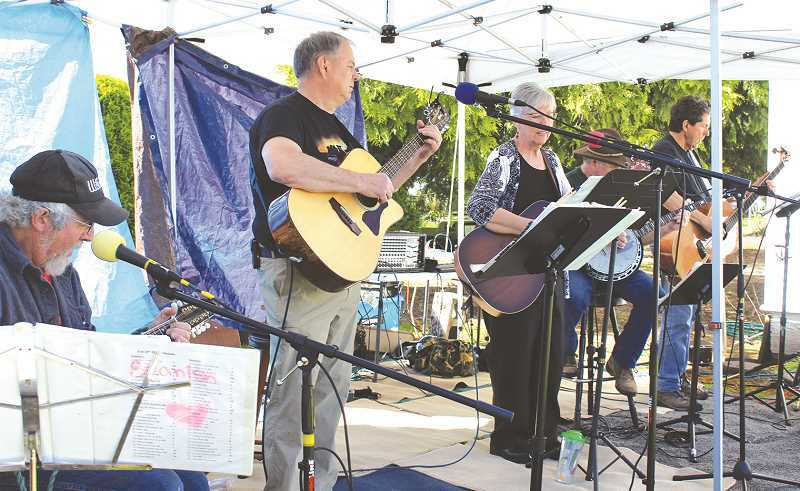 Get ready to enjoy Thursday evenings again as the Molalla Farmer's Market begins its summer run May 31 with entertainment, food, flowers, jerky and other goodies as well as the Power of Produce Kids Club. The market will run from 3- 7 p.m. through Sept. 27 at the Hoffman House Antique Mall at 523 Main St.
Each week brings a form of live entertainment starting with Al Rose and the Other Guys with their brand of county and oldies from the 50s and the 70s, according to Tom Sawtell, market owner. But the entertainers aren't just bands, the Oregon Reptile Man will come again as well as Hawk, Owl and Raptor Rescue, the Fire Department, Hope Animal Hospital with its well-dressed animals and Dr. Olesya Salathe a dentist who brings goodie bags for the kids and Close Encounters Raptor Rescue OSU. During the summer, the folks from Oregon State University are bringing their smoothie bicycle that lets kids pedal for a smoothie, another week they will check canning lids pressure, do pickling and jam and jelly demos. The Clackamas County Sherriff will bring police dogs and demonstrate how the dogs work for the kids and kids at heart. Ace Hardware has plans for an August Barbeque. Most important is probably the Kids' Club. It's open to children ages 4-12. When they first sign up they get a free $2 token that they can use to buy fruits and/or vegetables, plants to grow food or natural foods like honey, but not the Snack Terminal or jerky, said Sawtell. Each week they visit the club they can get another $2 token for a purchase or to save up to buy something big. But they can only buy natural foods. This promotes healthy eating habits and also teaches the kids the value of money. Nearly 600 children joined last year. The ones who won the drawing contest will see their drawings made into pins and buttons and given to Kids Club members at the end of the season. "The Kids Club is really popular," says Sawtell. "Some children insist to their parents that they have to come every week." Not all vendors will appear the first week, some come the first week in June like an ice cream booth that also serves smoothies and root beer floats. There also will be Kettle Corn and the first week in June brings TMK Creamery, Molalla's own cheese factory with cheese and cheese curds. The first few markets will offer vegetable plants like squash, lettuces, peppers, tomatoes, beans, peas and beets. Later there will be ripe vegetables and herb plants such as basil and cilantro. In mid-July, Sawtell and his wife drive to Hermiston to pick up watermelons and cantaloupes. "Some of those watermelons weigh about 25 pounds, he said. Carrying those huge watermelons is quite a feat, he added, but the market has volunteers to help visitors carry the heavy items to their cars. If you're wondering why it's on Thursday instead of Saturday, it's because the bigger cities like Portland, Beaverton and Hillsboro among others hold Saturday Farmers Markets and some of the same vendors go there. This way, Molalla can get all the vendors people want to visit with. The market accepts WIC and Farm Direct for seniors. Parking is not a problem, according to Sawtell. He notes there are plenty of places on the street as well as a nearby church and the Hoffman House Antique Mall at 523 Main St., which surrounds the market.